1 item: $2.756-11 items:$2.50 ea.12-24 items:$2.25 ea.25 and up: $2.00 ea. These colorful Red Lion Brand Terry Cloth Head Bands are made of Medium-Weight plush Terry pile Fabric, and will look great as you perform any Athletic or Leisurely Activity. 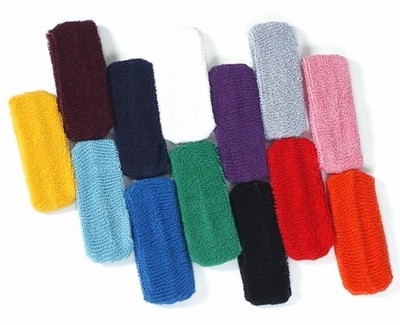 Colorful Terry Cloth Head Bands measure approx. 2 inches in width, One Size fits most. � Gold, � Maroon, � Light Blue, � Navy Blue, � Royal Blue, � White, � Green, � Purple, � Black, � Silver, � Red, � Pink, � Orange, � Neon Pink, � Neon Lime Green, � Neon Orange.